Covering a large area to the west of Florida, the Bermuda Triangle maintains a reputation as a place of mystery for mostly gullible people. Over the past fifty years or so, stories about plane and ship disappearances in this area have been exaggerated, embellished and eagerly believed by those who frankly should know better. 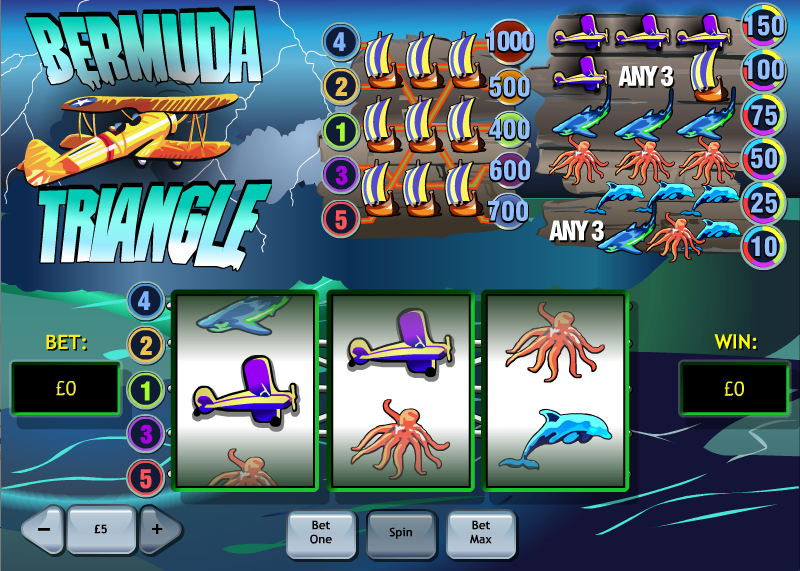 Anyway, it’s a good theme for an online slot and that’s what we have here – it’s called Bermuda Triangle and it’s by Playtech. It’s a basic three reel game but don’t let that put you off; read on to find out more. Bermuda Triangle plays out over three reels and five paylines and the backdrop to those reels is a stormy ocean scene. In the top left hand corner a biplane is buffeted by the wind and presumably on the way to a watery end. There are just five symbols here and they include an octopus, a shark, a dolphin, an aeroplane and a ship – all residents or passing through the area. It’s all pretty simple, just select your bet size with the ‘+’ and ‘-‘ buttons in the bottom left hand corner and then decide whether you want to use the Bet One or Bet Max to play with one to five paylines. Now press spin and away you go! Three of any symbol will win but you can also win with mixed animals or mixed planes/ships. The ship is the most valuable symbol with a possible 1000x your coin bet for matching icons. Obviously there’s not much to this game but sometimes that’s Ok – just press the button and spin the reels to see if you win or lose. You can wager between $1 and $25 per spin and there’s an RTP to the player of a pretty reasonable 96.73%.